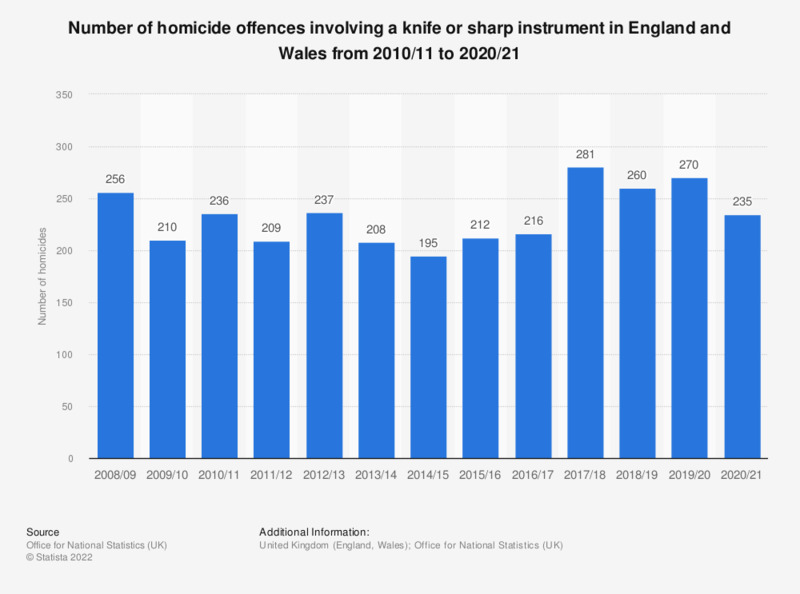 This statistic presents the number of homicides involving a knife recorded by the police in England and Wales from 2010/11 to 2017/18. Although knife homicides declined between 2010/11 and 2014/15, from 220 homicides to 179, they increased after this reporting year, reaching a peak of 263 homicides in 2017/18. Knife crime offences in general have also been increasing in England and Wales, and particularly in London where almost 15 thousand offences were recorded in 2017/18. * These figures exclude Great Manchester Police due to a review in how they reported knife crime offences. ** Figures for 2010/11 to 2015/16 are for years ending March 31, while 2016/17 and 2017/18 are for years ending September 30.